If you’ve not started already, it’s time to get barbecuing. Spring is well under way, which means that summer is right around the corner and evenings spent outside with something delicious on the grill are about to become a frequent occurrence. This weekend, try this delicious recipe for BBQ pork back ribs with a bottle of our Big Red BBQ Blend. 1. Remove membrane from underside of ribs, if attached. In large dish, combine sugar, paprika, chili powder, pepper, garlic, cayenne pepper and salt. Add ribs and rub all over with spice mixture. Cover and refrigerate for 8 hours or for up to 24 hours. 2. Rib Sauce: Meanwhile, in saucepan over medium heat, combine ketchup, sugar, paprika, chili powder, Worcestershire, garlic and hot pepper sauce; bring to boil. Reduce heat to medium-low; simmer until reduced to about 1/2 cup (125 ml), about 15 minutes. Set aside. 3. Set foil drip pan under 1 rack of 2-burner barbecue or under centre rack of 3-burner barbecue. Heat remaining burner(s) to medium heat. Place ribs, meat side down, on greased grill over unlit burner. Close lid and cook, turning once, until meat is tender and pulls away from ends of bones, about 1 hour. 4. 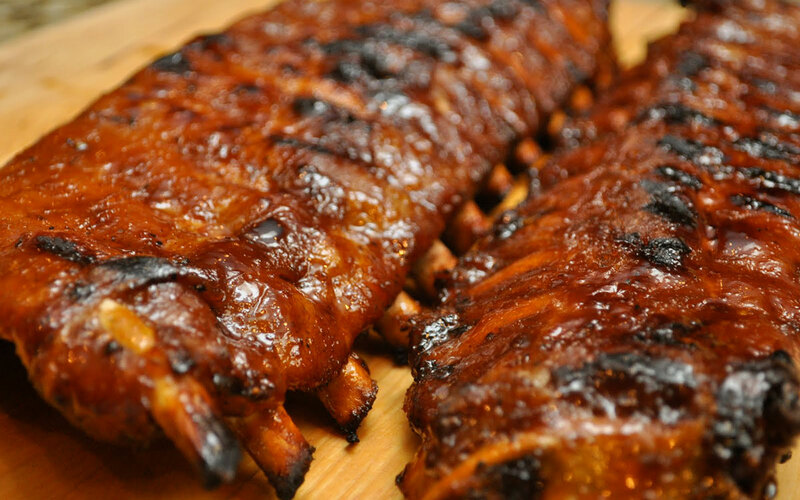 Brush ribs with about half of the sauce; cook, turning once, until glazed, about 10 minutes. Serve with remaining rib sauce on the side.